It all started last summer when my beloved Thomas (a.k.a. 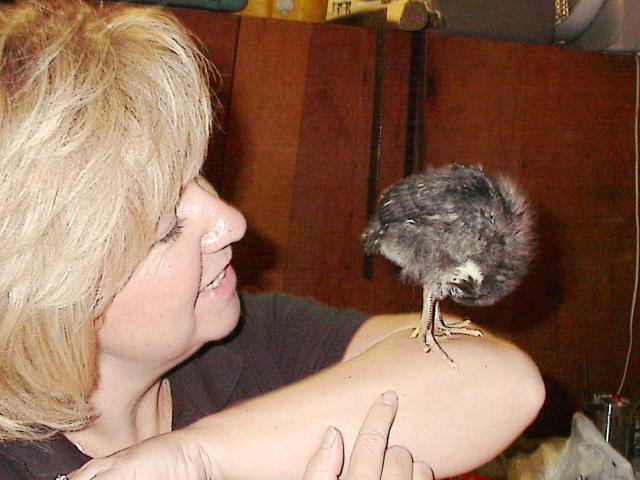 Tomcat) and I decided that urban chicken keeping was something we wanted to consider. Truth be told, it started because I asked Tom if I could have a goat. When he said NO! I suggested maybe chickens and he said okay. So, with the help of the great wide web, here we are today! 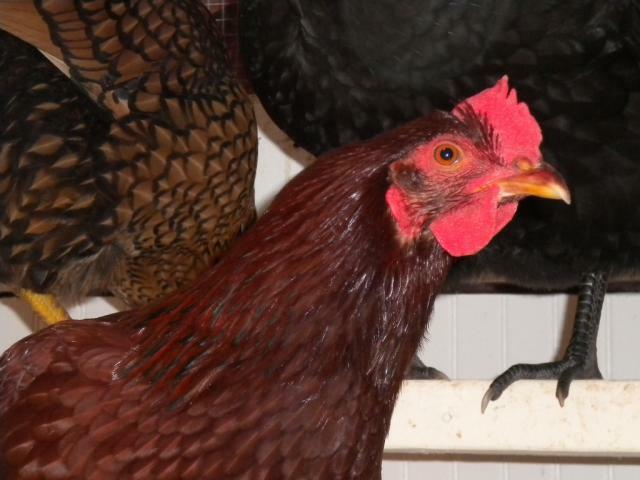 After much research on just what it would entail, we started making plans....I researched and selected the breeds I wanted in our flock, color coordinating and all (no ordinary chickens for us!). Tom began his elaborate plan for our coop. (You have to understand that with Tom, bigger is ALWAYS better and NOTHING can happen the RIGHT way without large man-toys!) 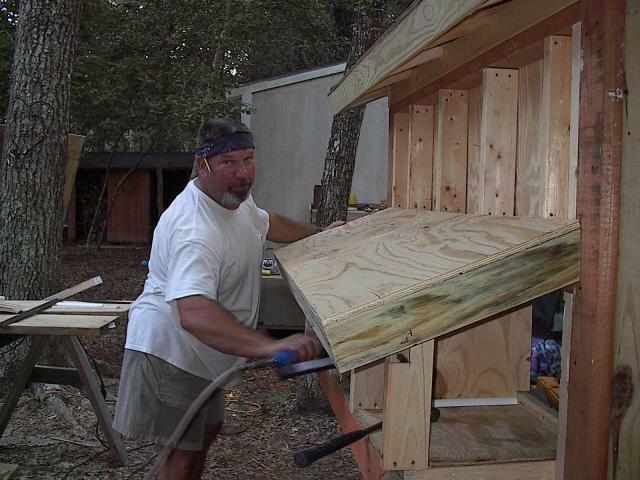 With building experience, tools, hardware and a creative eye, Tom set out to build for me an "artsy" coop.... the Coop DeVille as we've come to call it! We scouted out the best location in the back yard. 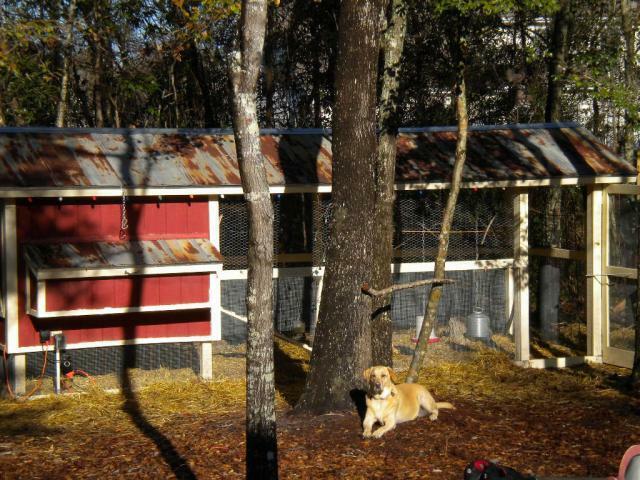 We wanted the coop to be shaded in the summer but warmed by the winter sunshine. 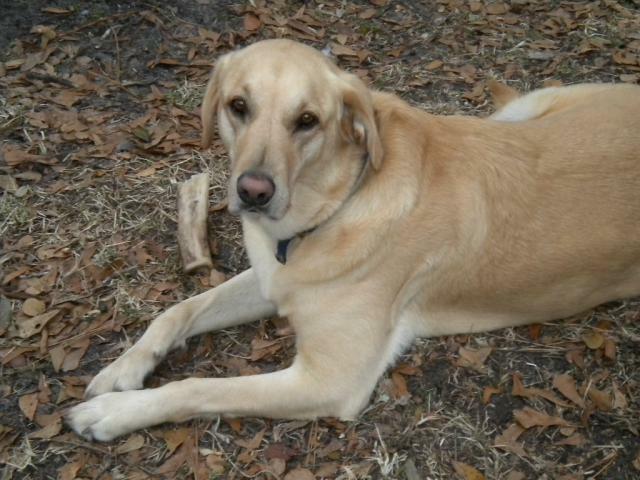 When we agreed on the spot Tom, with help from our yellow lab Yogi, set the posts and began. 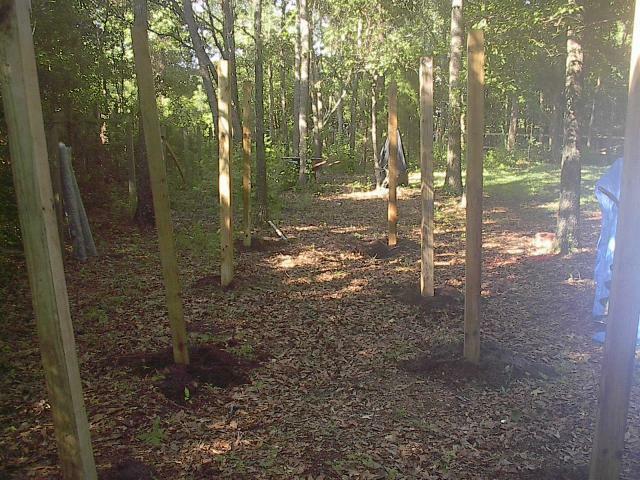 Eight 4x4 posts were set in concrete. 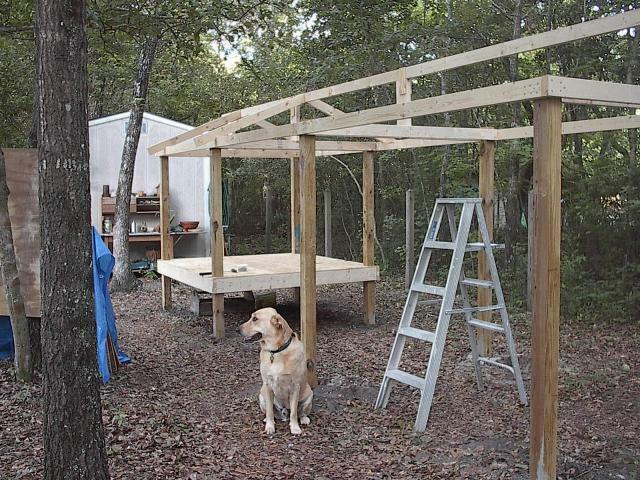 The coop measures 6'x6' set 2' off ground level. The attached run encompasses the underside of the coop and spans out a roomy 14' (roomy by our standards, however the "girls" much prefer the run of the entire back yard!) 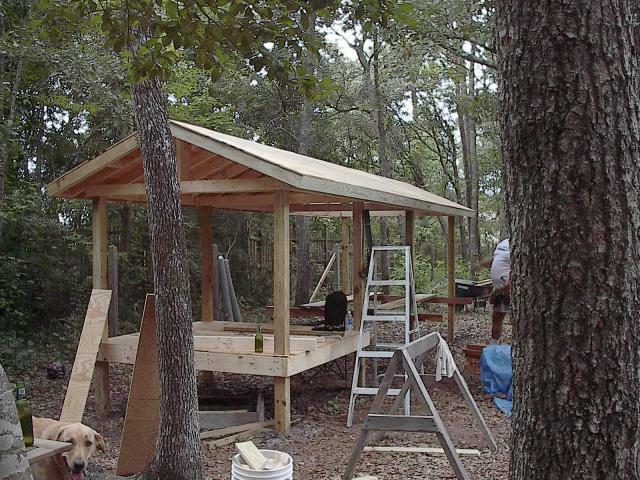 The roof is framed and covered with plywood and finished with recycled tin. Since the boys obviously have things under control outside I work on tending to the interior projects. 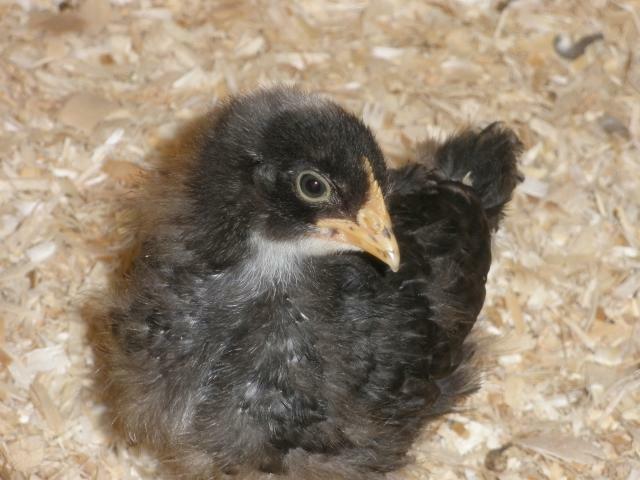 Our "chicks" are already here and have grown beyond their small brooder box quarters. 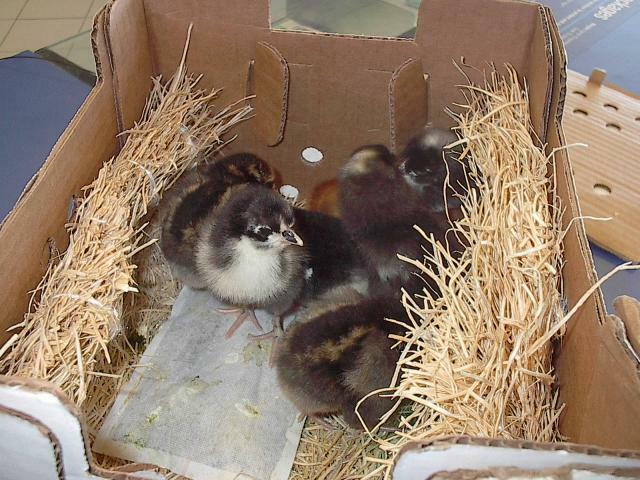 Tom built a covered juvenile detention pen in the garage for the growing "girls" and they are quickly outgrowing that! Several wet rainy weekends have delayed our progress. Arrival Day!!! We were soooo excited and they were so tiny! The floor is plywood covered with vinyl flooring. Tom's designed the floor for a bed of approximately 8" pine shavings. Most of the droppings end up under the highest roosting bar so clean up is easy. We turn the shavings every day or two to keep things clean. 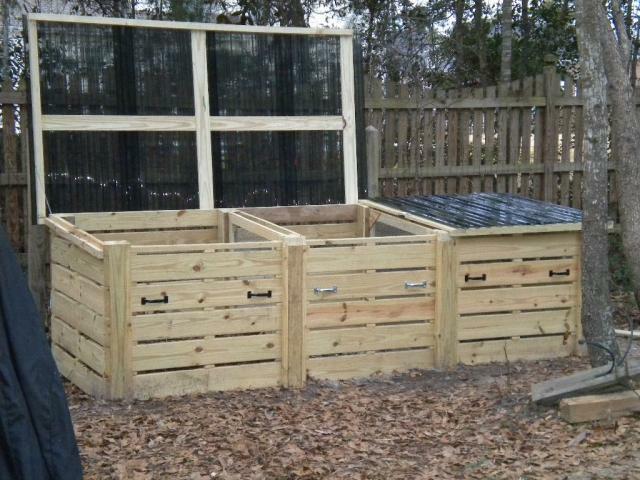 When the litter gets ripe, Tom's built us a really nice compost setup (picture below). There's a drain hole in one corner for easy spring cleaning. 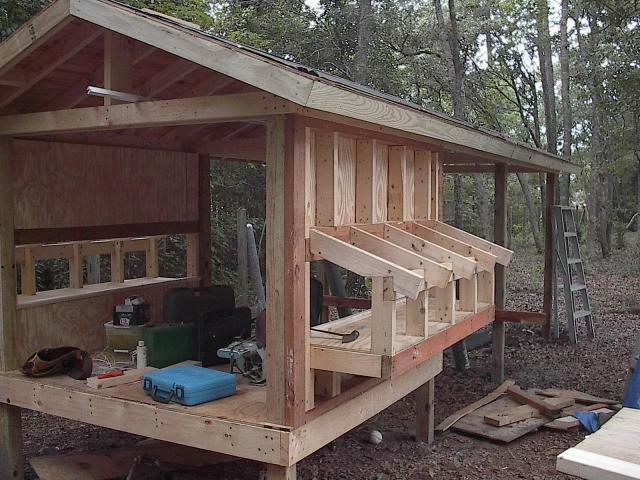 2x4's and standard frame construction make this a sturdy new home! Nest boxes, 4 on each side jut out and have hinged lids for easy access. 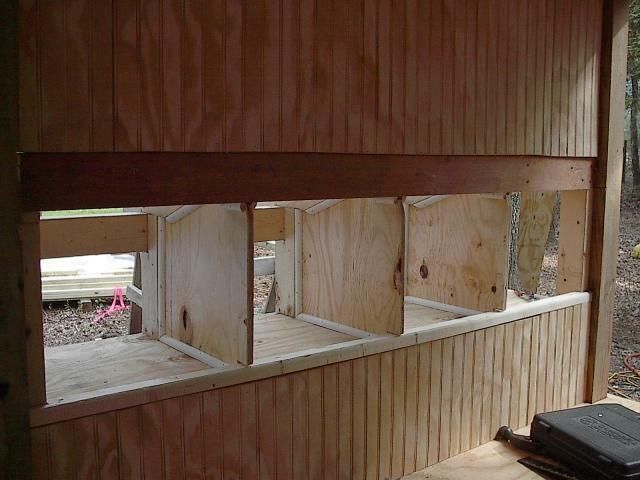 Insulated on the bottom and exterior walls, the nest boxes should keep our girls comfortable all year round. 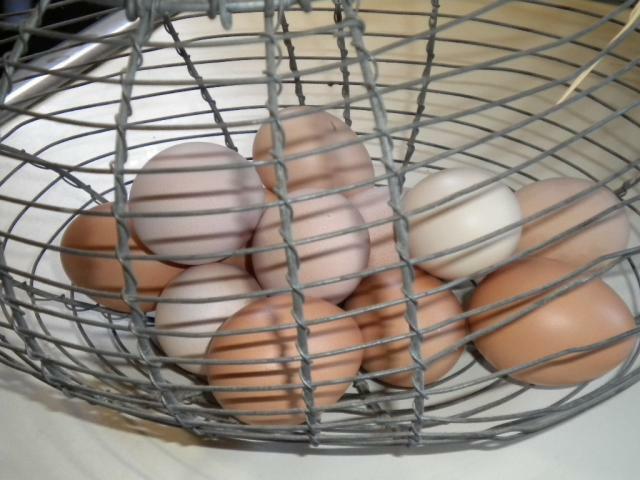 Hinged lids make egg gathering a breeze! 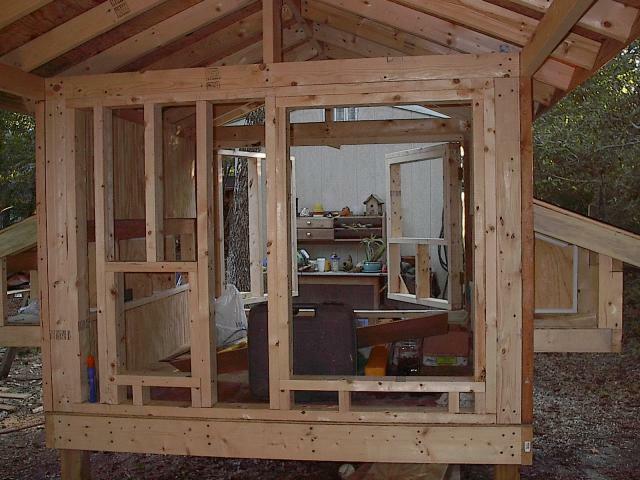 Interior walls are recycled bead board left over from an interior house project. We used lots of materials that we had on hand and some that were donated by friends. 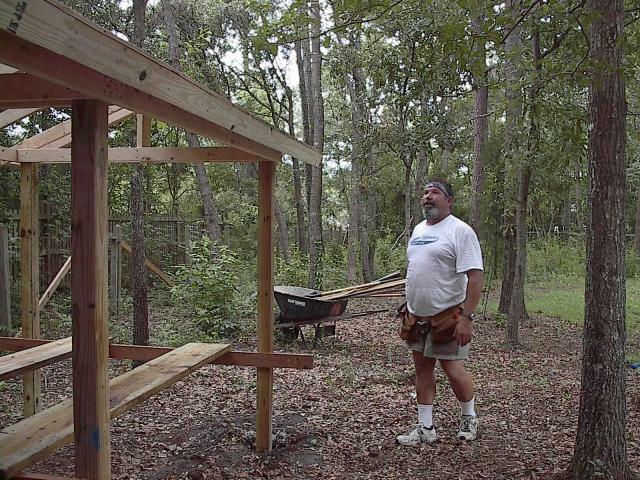 A rail perch will be added below the nest boxes for access. 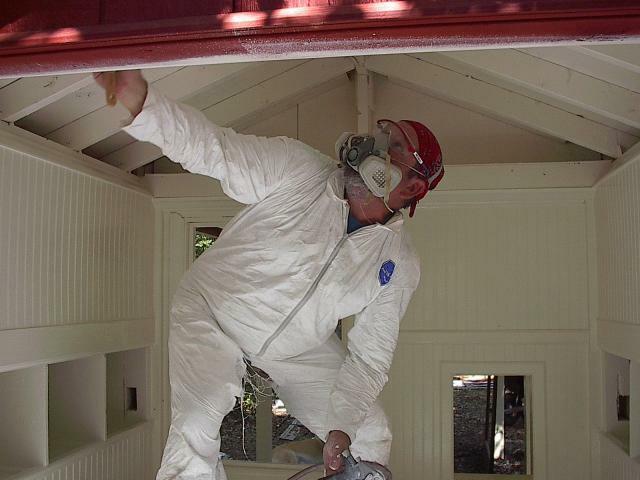 Tom, donning his favorite fashion look - a tyvek jumpsuit, painting the interior of the coop with an oil base paint. Moisture barrier and easy cleaning were the reasons behind the paint job. Doesn't he look like a professional?! 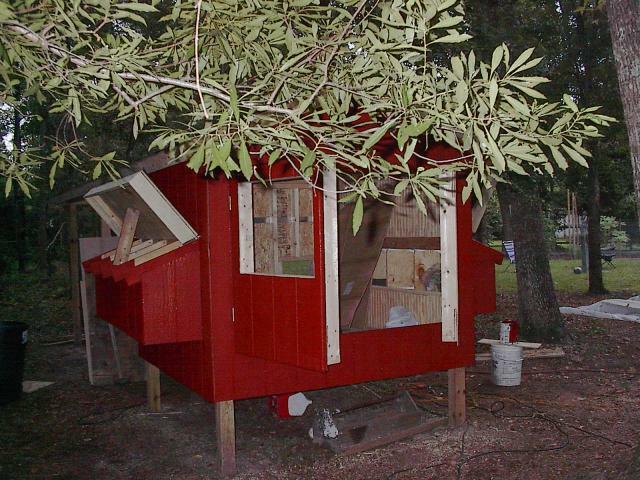 Only one color would do for the outside - barn red! 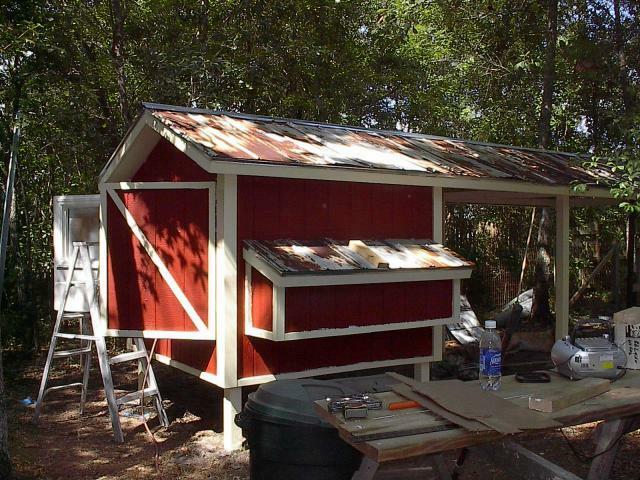 Besides being the obvious choice, it looks fabulous with the recycled tin roof! The trim color even matches our house. 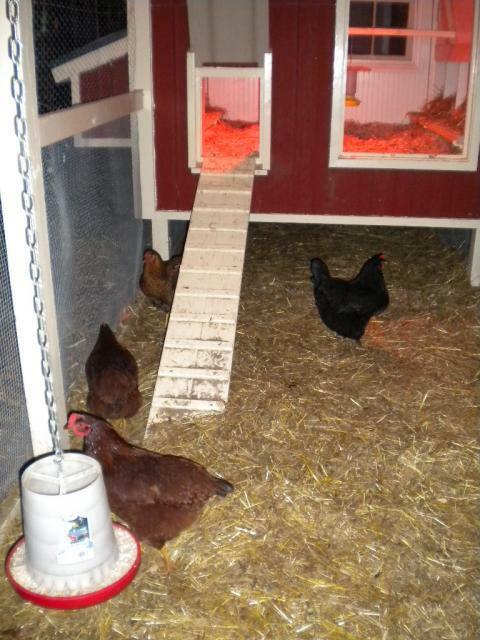 Roosting poles installed, litter and wheat straw bedding complete the coop. 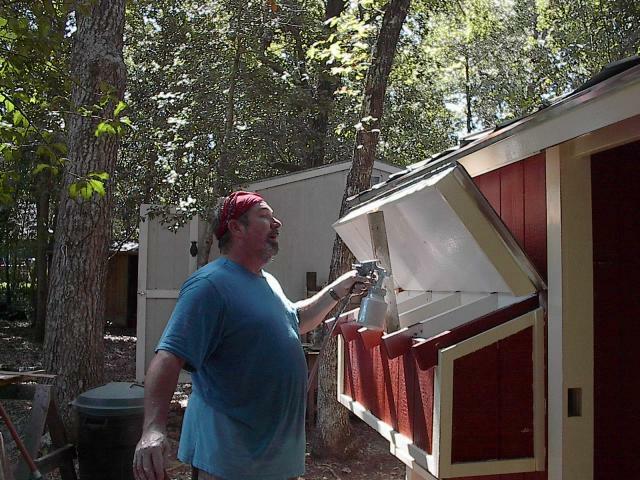 Feeders and waterers are installed both inside and out. We're ready for the big move! The girls seem to love their new home and we find it easy to keep and a joy to look at! Nanny often brings live crickets from a local bait shop for the girls. They also love live meal worms. I tried growing them but without much success! I do, however make warm oatmeal with applesauce for them on cold mornings! 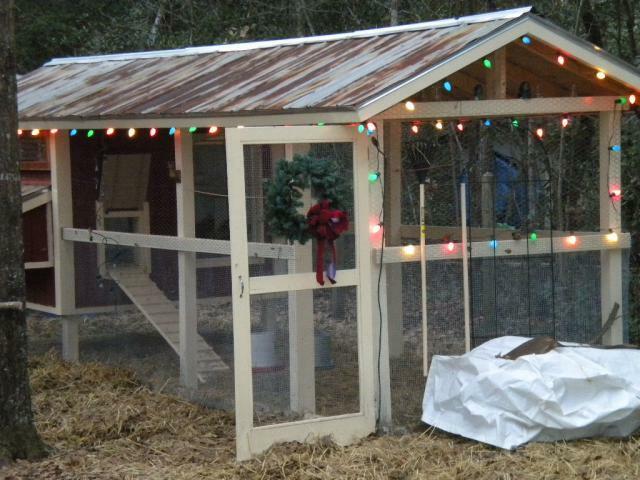 Our finished coop all decked out for Christmas! 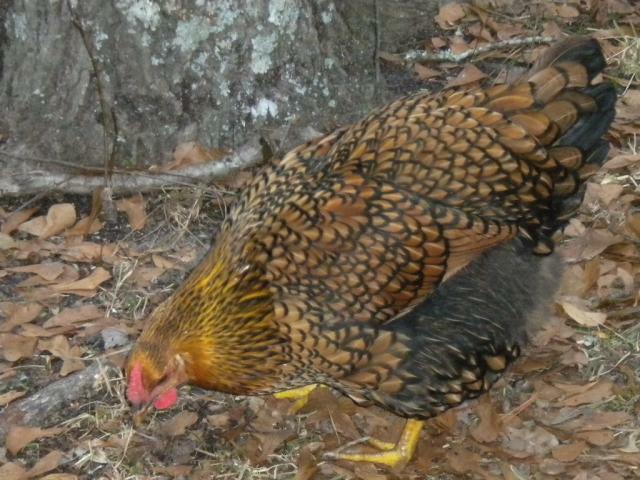 The decision to be urban chicken keepers has been a good one. We often have weekend visitors, both friends and even friends of friends who are just curious. 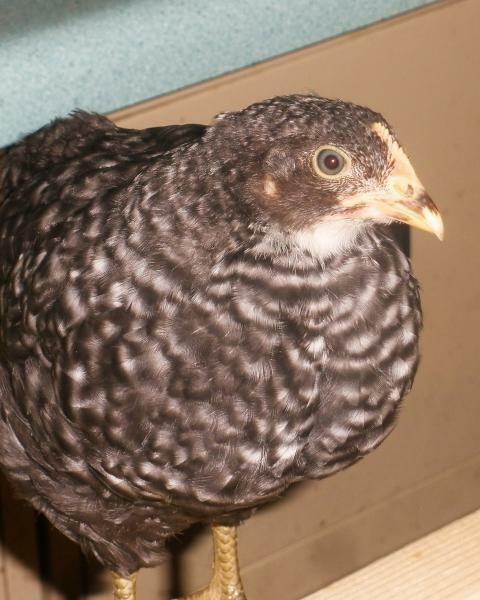 Everyone who has been by is fascinated with the birds, the coop and just why and how we came to do all this. 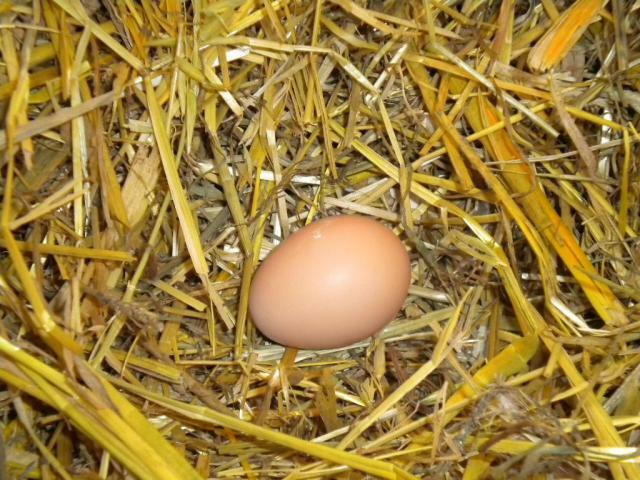 Many are planning their own coops. 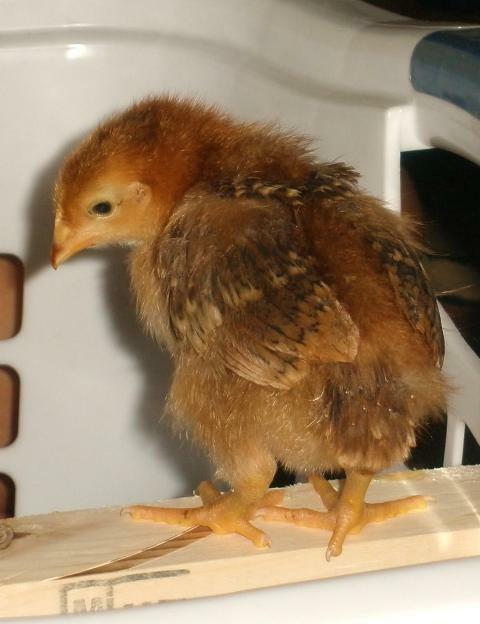 The children in our neighborhood have all participated in the raising of our tiny biddies. How many of them would have grown to adulthood and never had the experience of holding a day old chick or finding a still warm egg in a nestbox? We love our birds and are truly touched at what they've brought to our lives. I can't imagine a life without them! ...and by weeks end our first dozen. My Christmas wish - a compost bin! Yogi, Our watch dog. Eunice, our BIG girl! Happy Henny Tenny. 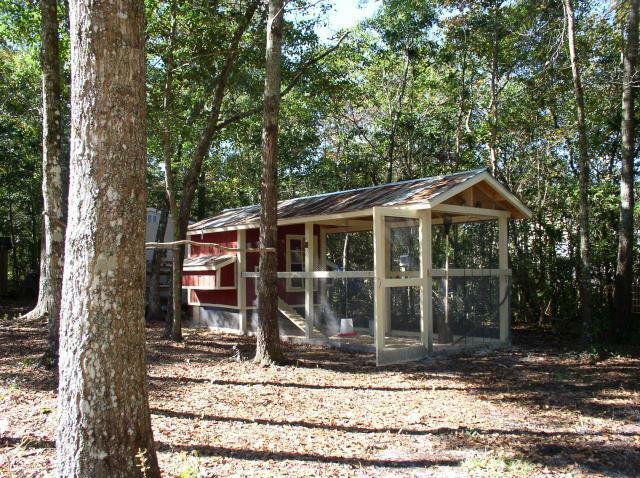 "Great progress pics and a beautiful coop/run!" This is fantastic!! I've been researching for a coop of our own, and this is amazing. Do you have any more plan specifics (on size, materials) you could share? Thanks!